The Cisco 1760 Modular Access Router offers small to medium-sized businesses and small enterprise branch offices a 19-inch rack-mount access solution designed to enable them to grow their e-business capabilities. The two different versions of the Cisco 1760 Modular Access Router, the base version Cisco 1760 and the pre-configured version Cisco 1760-V, address the needs of customers who want to deploy e-business applications - now or in the future. 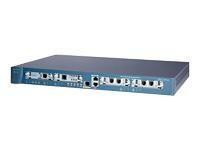 The Cisco 1760, as a modular platform in a 19-inch rack-mount form factor, offers customers secure Internet and Intranet access, as well as the capability to implement a variety of e-business and voice applications. This includes Voice over IP (VoIP), virtual-private-network (VPN) access, and business-class digital subscriber-line (DSL) as required.